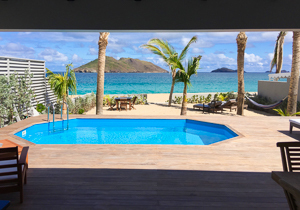 Villa UJV 173, also referred to as Ecoute Les Vagues, is a lovely 3 bedroom beachfront villa, located on Flamands Beach, St Barts, just a few steps from the blue water and white sand. This charming property offers a peaceful retreat from everyday stress. You will enjoy taking a nap while hearing the sound of the waves breaking on the beach. The three air-conditioned bedrooms are connected from the interior. The master bedroom offers an ensuite bathroom with double vanity and a walk-in shower. The two other bedrooms share a bathroom, open to the terrace, and face the beach view. The comfortable living room opens onto the pool terrace and faces the splendid ocean view. At the back is a well-equipped kitchen, separated from the living room by a bar. Please Note: There is a rental unit located on the lower level.